Yeah, yeah, I know. You’ve heard it so many times before either from us or any of the other marketing leaders out there— social media is integral to growing your business. But some of y’all are hearing those words and not actually acting on them. I’ve said it a thousand times before, and I’ll probably say it a million more times: social media is not just a checkbox for marketing. It’s so much more than that. It’s your reputation, your legacy, your lifeblood. And if you lost everything tomorrow, what you’ve built with social media is all you’d have left. Most people responded that they wanted a social media manager. Here’s why that’s concerning: social media should really be one of the last things you outsource. Why? Because why would you hire someone to mimic your voice? For me, modern marketing is organic— it comes from within and flows out. We all have purposes, visions, and objectives behind our business, so it doesn’t make much sense to outsource those purposes, visions, and objectives. This is especially because social media is one of the most direct and optimal ways of getting your voice out there. Many of us try to keep our business and personal lives separate but when you’re trying to spread your vision, that’s not really something you can do. Because if your business is positioning you in a place where you’re too afraid or not able to promote who you truly are then you’re either in the wrong business or haven’t allowed yourself to fully become the voice of your brand. Getting personal on social media and being open with people can really be an uncomfortable concept for some people. 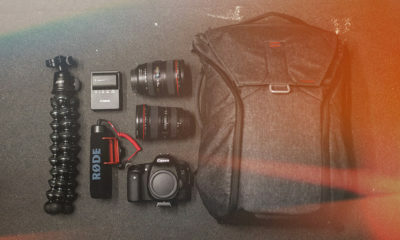 Being that present and documented in your day to day life can be intimidating. But you need to take a hold of the reins and feel comfortable doing you on social media for the sake of your business. Social media needs to be your lifestyle. 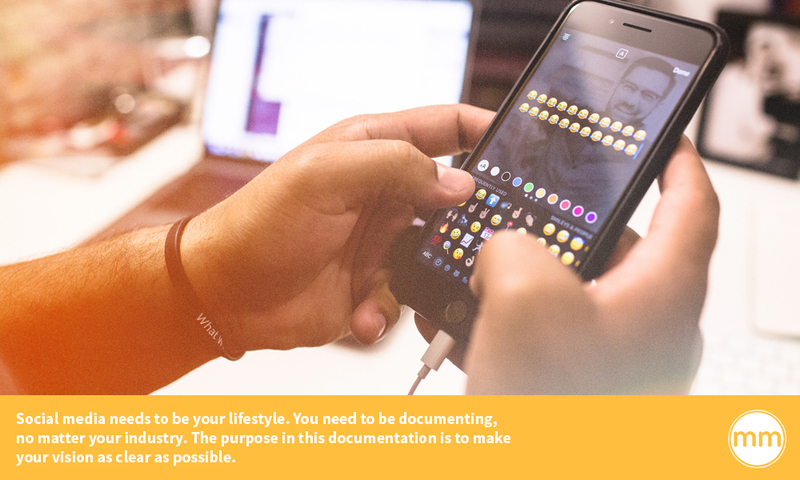 You need to be documenting, no matter your industry. The purpose in this documentation is to make your vision as clear as possible. Anyone who’s made it in this world is a living testament for being able to communicate their vision so well that they got people to spread their vision for them. 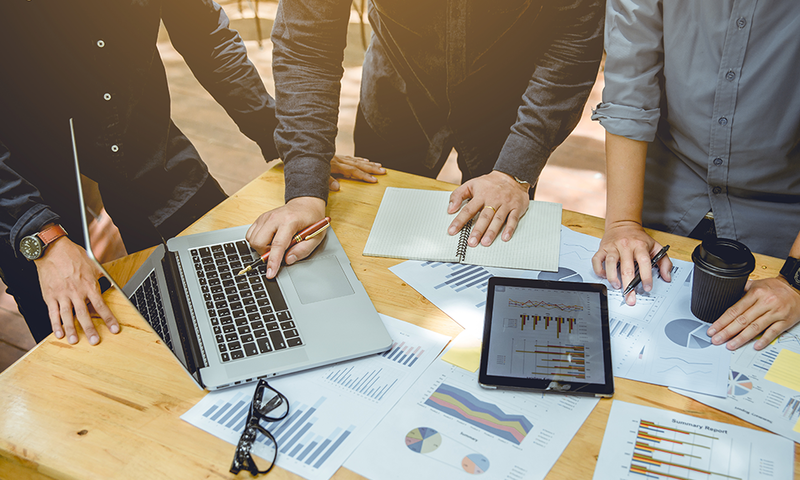 Too many people are letting social media take a back seat in their business because they’re worried that marketing is going to replace business development. It’s really paradoxical. What inevitably happens when you’re doing well on social media is that it becomes it’s truest form— which is business development. It was created so people can come together and spread their message with people they wouldn’t be able to reach in their everyday, offline lives. We’re at this place in business where business owners can no longer be business owners behind closed doors. There are some cases where maybe a CEO isn’t comfortable in front of a camera, but offline that CEO talks to people all the time. There’s this weird disconnect between humans online and humans offline. We elevate people on social media as this daunting presence, like they’re not real humans. 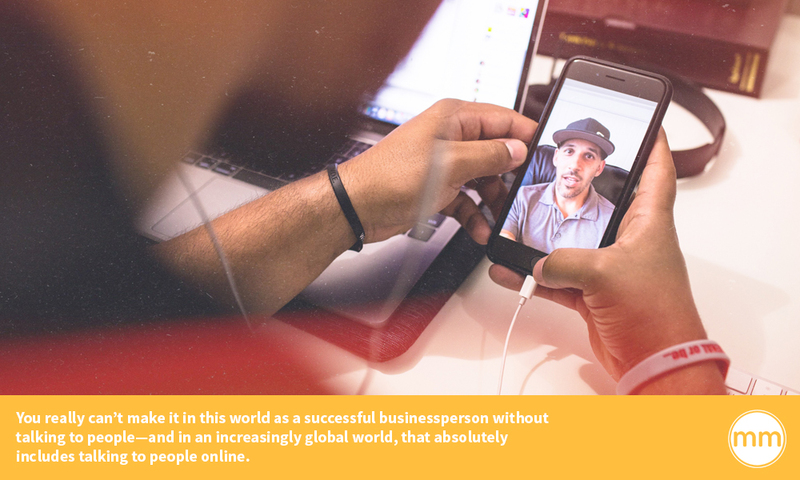 You really can’t make it in this world as a successful businessperson without talking to people— and in an increasingly global world, that absolutely includes talking to people online. Modern marketing is you becoming the marketer. It’s you reaching people with your message beyond just the transactions in your business. This is one of the major things people in The Modern Marketer community are hearing but not executing on. So building off the first point of not just doing social media but being social media, your being social is your business development. 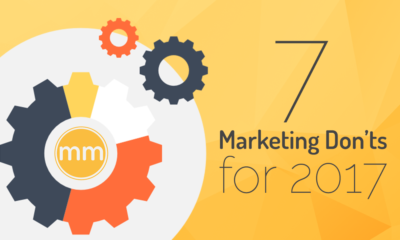 Marketing is supposed to accelerate your business development. 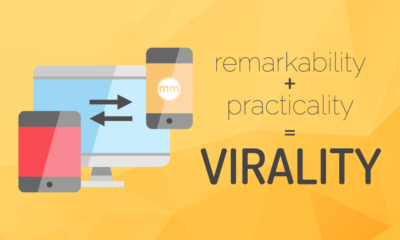 So if you’re crushing social media, you will catch more people’s attention in business. Don’t be one of those business owners that checks out on social media. Use it for business development. Think about the ACE digital sales funnel for a second— Acquire, Convert, Engage. Very rarely do we hear people say they want to engage people after the sales transaction so they can grow their voice or build a platform that cannot be broken. 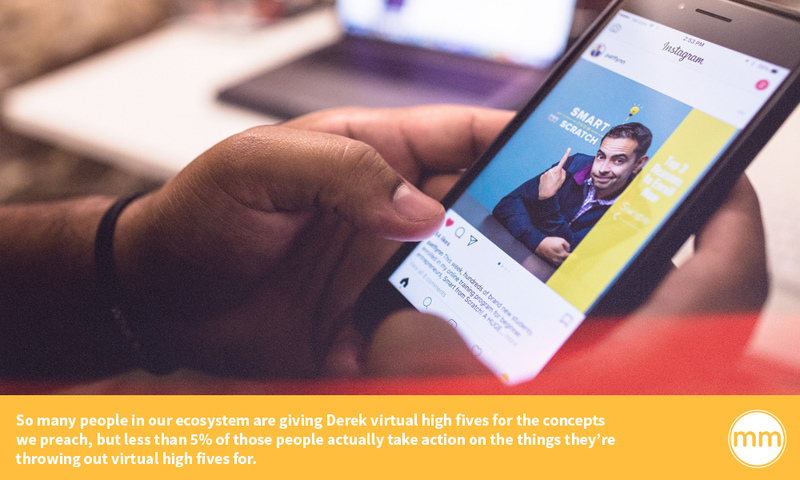 Especially because so many people in our ecosystem are giving me virtual high fives for the concepts we preach, but less than 5% of those people actually take action on the things they’re throwing out virtual high fives for. It’s one thing to get excited and inspired, but it’s another to actually act on your inspiration. And this isn’t just something we preach without practicing either. Most businesses discourage social media at work, but I actually want The Modern Marketer team to be on social media throughout the day. At least five times a day. Your vision in business? It’s not just about you. Stop keeping your vision to yourself. If you died today, your transactions would die with you. But if you have a platform, a voice, a team, a community— you actually leave something behind for your loved ones and circles of influence. Your voice and your message is your legacy. Don’t let it go quiet. Some of the OGs of The Modern Marketer community, the ones who have been around since the early beginnings of this business, are not executing some of the content and social strategies that they’ve been raving about all this time. Don’t be one of those people. We know you all are busy running your businesses, and so are we. I could be doing a million other things instead of Monday Masterclasses but because it’s so important to engage and communicate the vision of The Modern Marketer, he keeps showing up. Nothing in your week is more important than spreading your vision. If your vision lives only in your head and in your transactions, nobody cares. And I guarantee you the second that your customers find a better price or a more convenient option, they’re dipping out. Because you haven’t engaged them with your vision. Without your social media, without your content, without spreading your vision, you’re losing each day. Slowly fading out. It’s not just some high and lofty, blanketed statement that social media marketers regurgitate because they heard it somewhere. We say it because it needs to become a part of your business a year from now. This community is the breeding ground for some of the greatest entrepreneurs and business owners of our generation. You need to be empowered to extract your own purpose as we do in life and business together. So stay connected in this space and keep spreading your vision. Over and over and over. Get inspired, but actually act on that inspiration. You’ve got to be more social. If you’re going to prioritize anything in your business week, prioritize engagement over everything. The connections you make are the foundation for your business development, for your legacy. Understand that social media is crucial to your growth as a business, and then act on it. 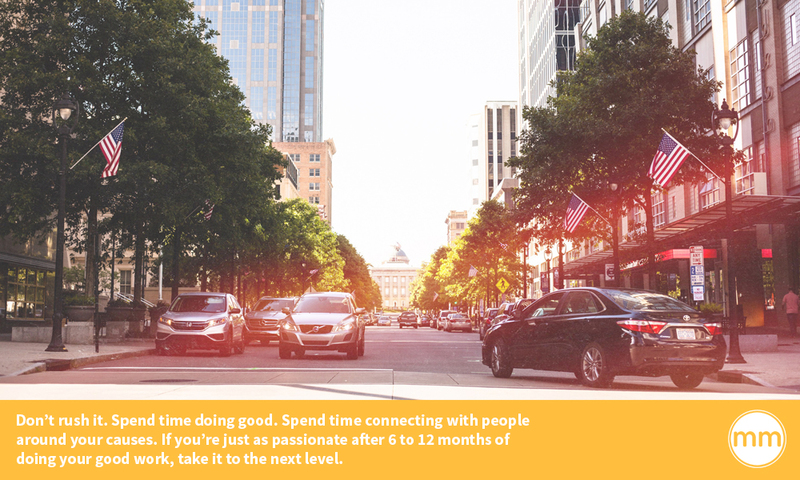 You can’t grow if you’re not showing up and building connections not just offline, but especially online. Make use of this business community. Some of the greats of our time are incubating in The Modern Marketer community. Stay connected. Masterclasses are every Monday at 12pm EST. Inbound Marketing vs Modern Marketing: What is True Social Distribution? Want to Accelerate Your Brand Growth? Let Your Objectives Guide Your Tactics. Last Monday’s Masterclass was all about practically applying our tips to your business. A common narrative amongst the followers of The Modern Marketer seems to be rooted in the response that people don’t have the money to be spending on a lot of the tactics that we promote. But here’s the issue: if you try to blindly execute these tactics without understanding a higher level context of how they apply to your business, you’re going to be spending a lot of money for little return. When you spend money and realize you don’t have enough to accomplish what you want, you’re overcompensating for what you’re lacking at the foundational level of your business. You have to take care of home base first. This all starts by understanding why you’re doing what you’re doing. At the end of the day, everything you’ve done in that day for your business should lead back to a greater objective. So what are your objectives in business? Is it to get more reach? Is it to convert customers? To further develop the process of your sales funnel? To run more effective ads? To more effectively distribute your content? This is what’s happening now. It’s essentially what’s right in front of you, the more immediate things. For The Modern Marketer this means creating and distributing content, posting on social media, and taking care of Palizay Media client needs. That’s what’s immediately on our plate. These objectives are ones that can’t necessarily be accomplished on a day to day basis, or even a week to week basis. 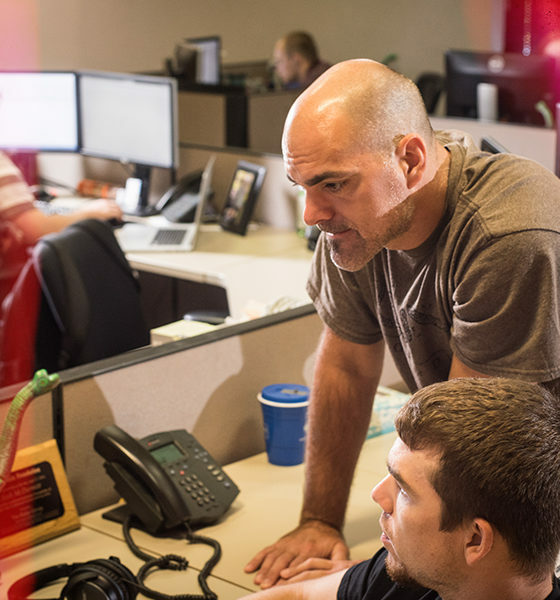 You want to have an awareness of what these objectives are, keep them in mind, but the nature of these objectives is that they will take longer to accomplish than your ground level objectives. A Horizon 2 kind of objective for us is to work with influencers in industries of interest— technology, manufacturing, consumer goods, healthcare. 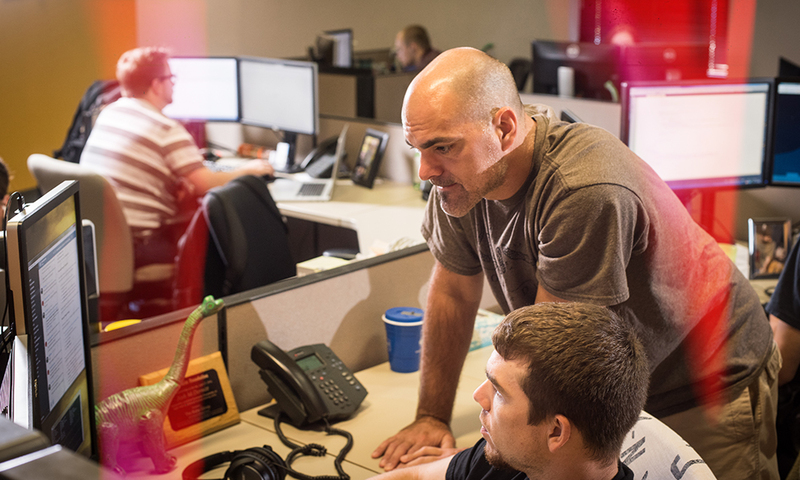 We don’t want to work with just any business in those industries, we want to work with thought leaders. 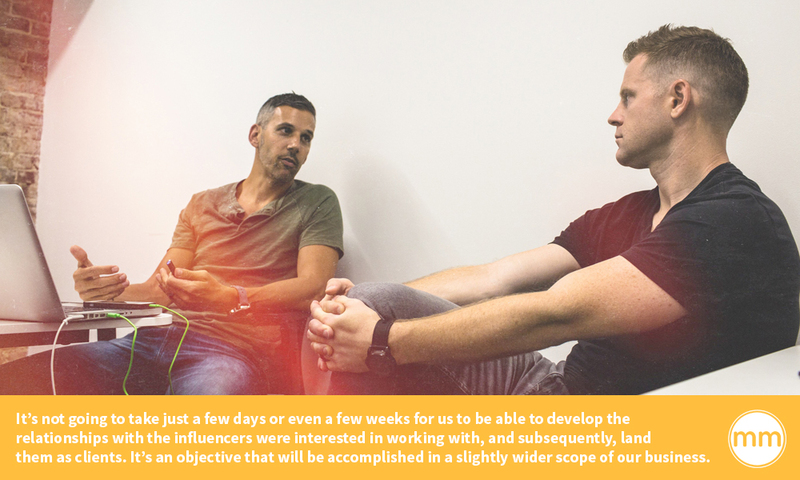 It’s not going to take just a few days or even a few weeks for us to be able to develop the relationships with the influencers were interested in working with, and subsequently, land them as clients. It’s an objective that will be accomplished in a slightly wider scope of our business. These are your overall goals in business. These are the objectives that you must plan for to work and, best case scenario, will ultimately lead you to the level you want to be at in business. Without these objectives in place and actively working towards them, your business remains stagnant. These are very much long term and higher level ideas. The Modern Marketer has a Horizon 3 level objective to level up our publication in a way that not only attracts more attention, but retains attention. To me, retaining attention is a very high level objective. Retention is a process. It requires us to really understand our primary and secondary audiences and the buyer personas behind each. Those are some very high level ideas that take a lot of shifting strategy and effort over a long period to accomplish. Now knowing what your objectives are and where they fall within these categories helps you to determine how exactly how you should be spending your time and energy, as well as your money. These objectives should direct your daily behaviors. They should inform how you approach tasks on a tactical level. For example, if you’re in the music business and are trying to get people excited about your music, you need to not only have music out there for people to binge on but also collaborations to match. People won’t get excited unless you can show that you’ve created a lot of music and also worked with other people to get your music out there. In any business, you need a home base of content for people to binge on. That’s the only way you can keep that attention. But if you’re just creating content for your own sake rather than within the context of your objectives, people aren’t going to care. This is the whole definition of inbound marketing: having people qualify themselves into your brand by earning their attention and interest. 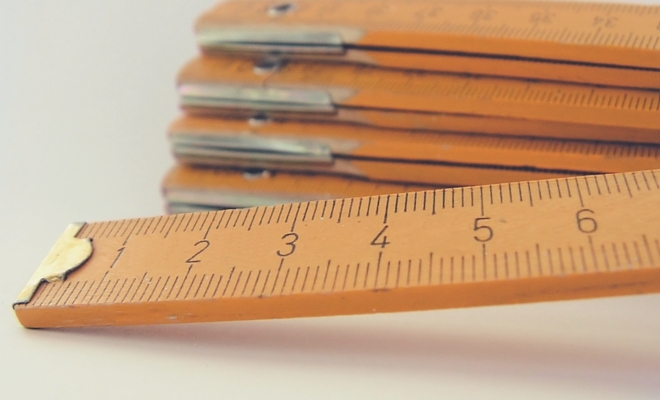 If you’re going to make any cuts in your budget, your content needs to be the last thing that you cut. 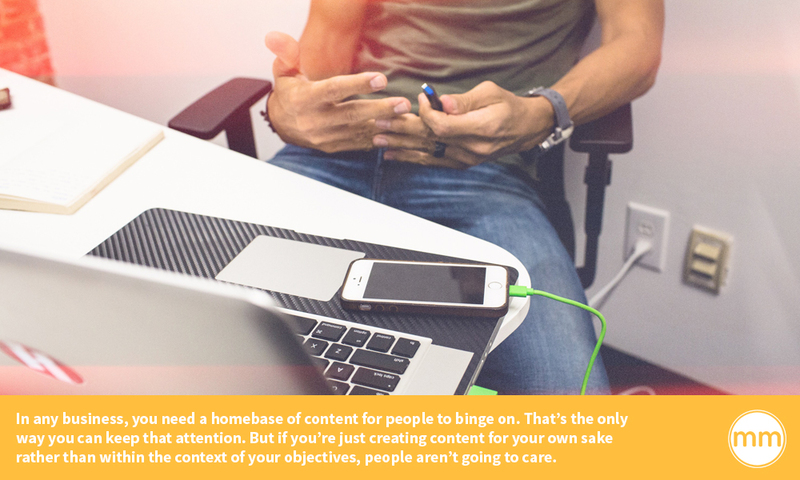 Everything you do in marketing is based off of your content because it’s your homebase. It’s your foundation. If you don’t create content but decide to throw money at Facebook ads, or at optimizing your SEO, or paying influencers to promote your brand, it’s like you’re continuously building a sandcastle while the bottom is being washed away. I mean, seriously. It makes no sense to build something with an unstable foundation, so why would you throw money at your business if you’re not making any effort to build up your content? And when I say “build up” your content, I’m not just talking about creating and publishing content on a consistent basis. Because honestly, every time you create a really solid and valuable piece of content, you’re putting a piece of yourself into it. People need to see it for it to truly be valuable. If people aren’t seeing your content, you’re not building a foundation. You’re just exhausting yourself. Use what you have in front of you. Building that foundation is not just about creation of content, it’s about distribution. You have to get that content out there in as many ways as you possibly can. Get creative with your distribution! 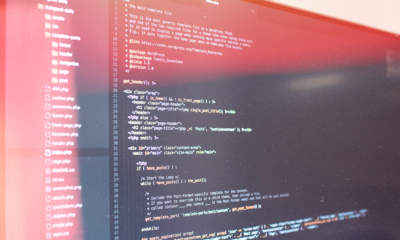 The Modern Marketer is optimizing distribution by making sure our documentation is cross posted, repurposed, upcycled, and atomized. Right now we’re using not only our blog, but Instagram, Instagram Stories, Facebook, Facebook Live, our Facebook group, Medium, LinkedIn, and guest posting. 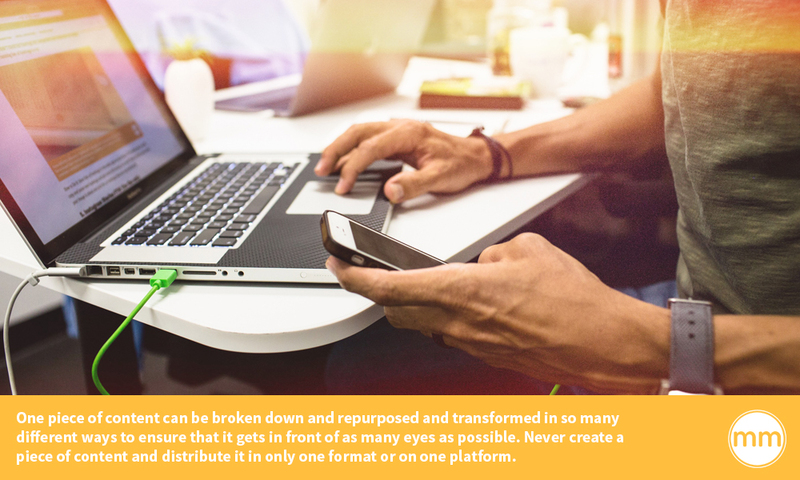 One piece of content can be broken down and repurposed and transformed in so many different ways to ensure that it gets in front of as many eyes as possible. Never create a piece of content and distribute it in only one format or on one platform. A great (higher level) objective for your content is to not only make it binge worthy, but worthy enough of your pride in sharing it. I am especially proud of The Ground Up Business Challenge because it has so much value and a piece of my heart. It was really one of the best and most well-received pieces of content he’s written. We actually created an entire program based off of it that will soon become available. Your content is the cornerstone of your voice. You have to ensure that the effort that you put into it is strong enough to build your business upon, or else you’ll be throwing money and time on a crumbling sandcastle. So knowing that the foundation of your business needs to be your content, and knowing that the objectives are what need to guide how you build that foundation, how do you ensure everything you’re doing, no matter how small, will actually yield results? By ensuring that everything you do leads back to the ACE Method you’ve set up. When you’re spending money and not accomplishing what you want, you’re overcompensating for your lack of a foundation or misguided objectives. 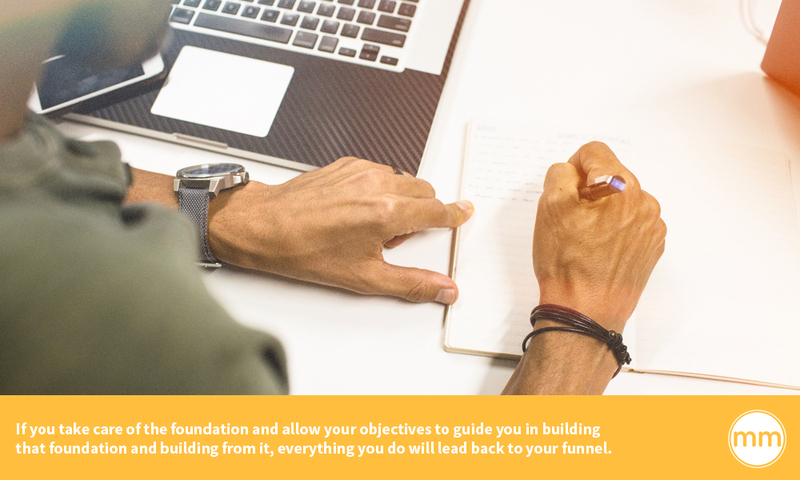 If you take care of the foundation and allow your objectives to guide you in building that foundation and building from it, everything you do will lead back to your funnel. Don’t get it twisted: everything you’re doing should either be to acquire, convert, or engage people into your business. For example, one of our clients, Dash, uses Facebook Messenger to talk one on one with people in a live responsive environment. This actually allows him to minimize his ad spend because he’s hitting several objectives at once. If everything you’re doing in marketing truly complements your funnel, you won’t have to worry about not having enough money to accomplish your goals. Don’t execute tactics without understanding the bigger picture. Visualizing your business in terms of your objectives, your foundation, and your sales funnel will help guide you in how you spend your time and money on a day to day basis. Even that higher level stuff should guide your everyday actions. Create and distribute content to build that base, use your objectives to guide you as you build off that base, and think on a tactical level in terms of the sales funnel. As long as you bare the bigger vision in mind, the rest will fall into place. “She always screams,” her dad had a distraught look in his eyes as he stood at the doorway of the children’s nursery. It was my turn to be one of the volunteers in my church’s nursery and I was looking forward to it. All the toddlers know me and we usually have a fun evening of playing with toys, reading stories, and having snack time. Chloe was a smart girl. She clung tightly to dad’s shirt and watched me with distrusting eyes. As I began to calm down the room full of screaming children, I was imagining all of them as grownups who are encountering our brand on Instagram. My brain was drawing parallels from how the real life human behavior of these toddlers pertained to building relationships online…. As I gave a screaming Chloe a drink of water and walked around the room with her, I kept using her name when I talked to her. This visibly began to calm her down within seconds. Why? Well, I was creating a sense of intimacy and comfort. The same can be put into practice with your business in the online space. It helps them feel valued. It allows them to trust you more quickly because you’re creating a bond. It helps you relate the them as a human being instead of another nameless user. It helps you remember them when you interact with them again. 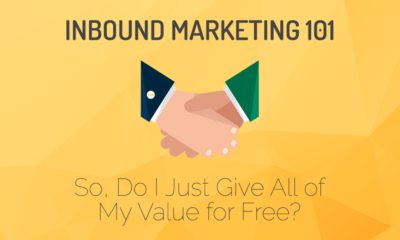 It really comes back to putting the human element back into your marketing practice. What’s more human than calling a person by their first name? 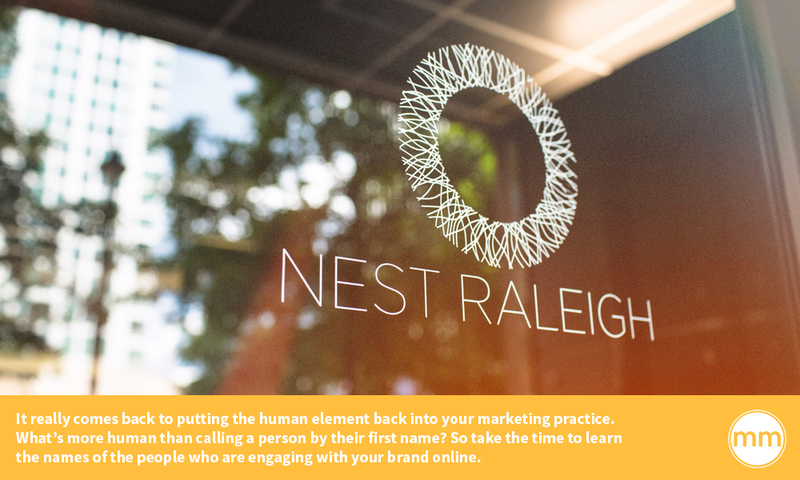 So take the time to learn the names of the people who are engaging with your brand online. This is just the beginning though…. Chloe had begun to calm down but she wasn’t happy. She looked at the door through which her dad had disappeared and burst into tears again. Miss Chloe needed a friend. I brought the distraught toddler to the low, U shaped table where everyone was getting ready to scribble on coloring pages. I introduced her to a toddler her age, who picked up a broken crayon and handed it to her with a chubby cheeked grin. Marketing is about storytelling. Storytelling creates community. 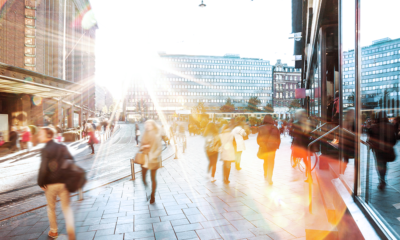 Effective marketing involves building relationships and connecting people to one another. 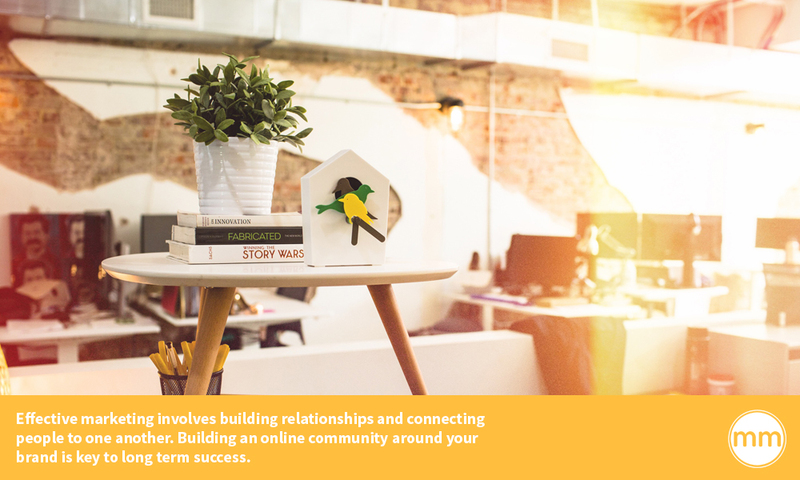 Building an online community around your brand is key to long term success. Too many businesses take a “look at me!” approach. 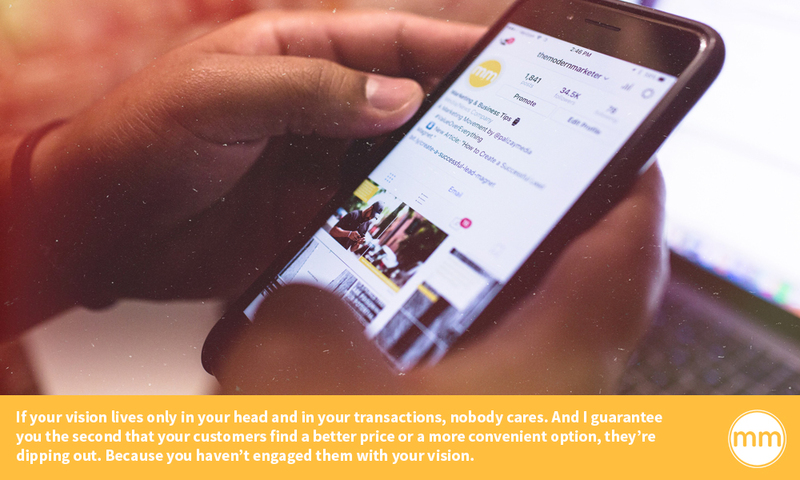 They forget that everything they are doing SHOULD be focused on the customer, not themselves. It’s human nature to want to connect with other humans. 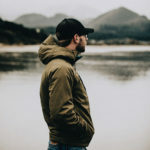 Brands that are good at forging connections among their advocates will create a vibe that serves to draw more and more people to them. Throughout my night of caring for that room full of toddlers, Chloe kept getting upset easily, and I instinctively knew that the most important behavior in the room was my own. I focused on remaining calm. I kept smiling. I used a soothing tone of voice when I was talking to her or the rest of the toddlers. Each time, I was able to reassure Chloe and the group that everything would be okay and soon they would go back to playing together happily. 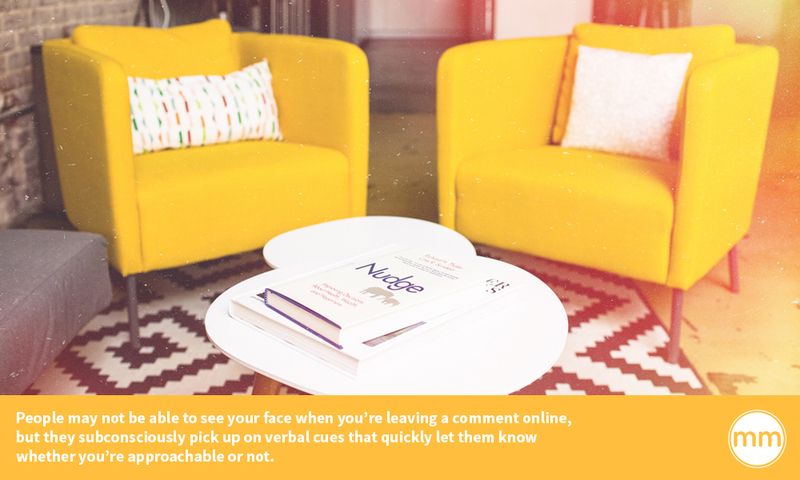 People may not be able to see your face when you’re leaving a comment online, but they subconsciously pick up on verbal cues that quickly let them know whether you’re approachable or not. You may not even realize what energy you are projecting through your online communications. That’s ok…. Just take a step back before you post and think about how it might be received by an outsider before you post. Read it and then reread it. Don’t be afraid of using smiling emoticons or funny ones that show your sense of humor. Be a friend to make a friend. I had to give Chloe more attention than the others during the entire evening, but I couldn’t afford to let the others feel left out. That would not have ended well! When I was feeling overwhelmed by the amount of needs in the room, I called in help from two other volunteers. I also recruited the happiest toddlers to help me with small tasks and praised them profusely. This inspired more of the toddlers to develop great leadership skills and help me with whatever I needed. In the same way, you should make sure everyone feels involved when you are building relationships online. When you’re commenting on a social thread, engage with more than one person even if you’re focused on the interaction with one of them. When you share a story about one person who’s watching your live video, make it valuable for everyone. For example, if you share a particular memory of that person or you comment on something they’ve been putting into action, bring it back to the topic you’re speaking on and relate it to everyone. Part of providing value to those around you includes involving them in what you’re doing. 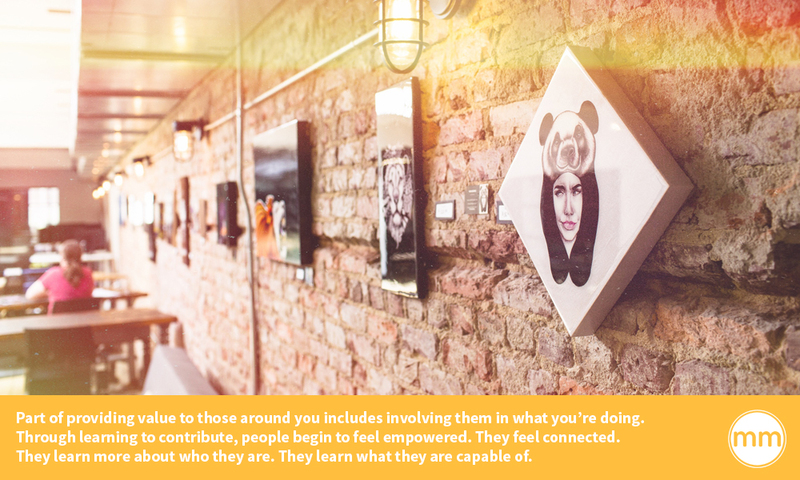 Through learning to contribute, people begin to feel empowered. They feel connected. They learn more about who they are. They learn what they are capable of. What have you learned from observing real life behaviors? Most of us love “people watching”, especially if we ever happen to be at a Walmart. I have to schedule some extra time in my day if I get a reason to go there, and not because the lines are long. Come on, I know I’m not the only one! Secretly, I would like to dress up in footie pajamas and be one of the crazy ones. I’m not brave enough to wear pantyhose as pants yet, but if I did I’d get my chance of going viral, right? You should be observing the real life behaviors of people around you everywhere you go. The Modern Marketer encourages us to watch what people do and how people behave. The same actions that help people feel safe or make someone smile can be applied to the ways we interact online. Be intentional about being around people simply to observe them. Spend time volunteering so you have the chance of interacting with human beings in what might be transactional circumstances. Think about the ways people communicate. Take notes about the differences between communicating with someone who already loves and trusts you versus someone you’ve met for the very first time. When you can draw from specific experiences, you will be able to learn specific tactics that you can then tailor to your approach to online marketing. Being a “people person” isn’t limited to face to face interactions. 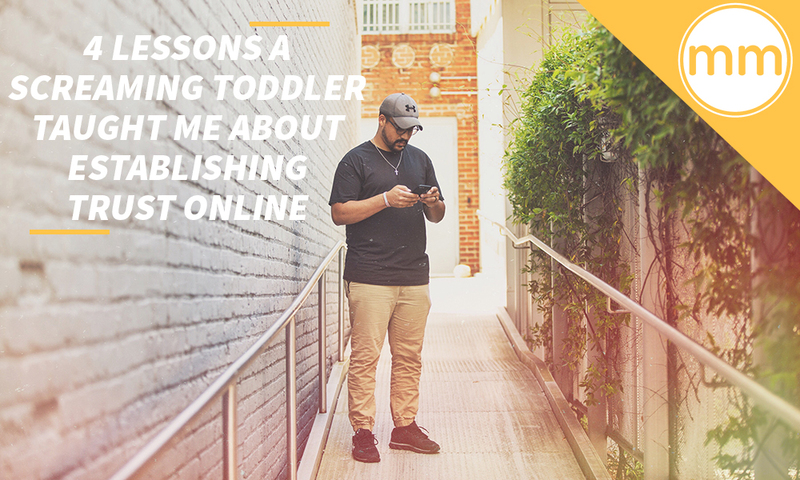 Little Chloe taught me a lot about how I can be a better marketer online, and my business will benefit greatly from these lessons. In our culture, we put a lot of emphasis and value on making money and “the hustle.” There’s nothing wrong with achieving success in that way, I firmly believe that anyone with a strong passion in life should pursue it. But there’s something to be said for pursuing a greater good— supporting and helping in a cause beyond yourself or profit. You may think that this type of work is left to nonprofits, that you aren’t able to help. The truth is that everybody has the capacity to provide social good beyond themselves, particularly businesses. Businesses have resources that can help more than individuals can do alone. Businesses, even small ones, have some power in society. In a society where too many businesses are wrought with corruption, It’s important to use that power in a way to create the most good. And no matter what you do and no matter how much your company makes, if you put people first, you’re a successful company. There’s a growing trend of starting nonprofits, and I suspect it’s just so people can say that they started a nonprofit and be associated with a brand of doing good. This is very disingenuous, because starting a nonprofit and truly following through with a passion to help people takes commitment. It’s a lot of work. And this not a kind of commitment that everyone can make. In fact, many people cannot make a commitment to create a successful brand around a good cause. Five years ago I wanted to start a nonprofit that encouraged people to live a life that was worthy of their passion or calling on their life. Back then, that looked like creating encouraging and inspiring content. So that was my vision. 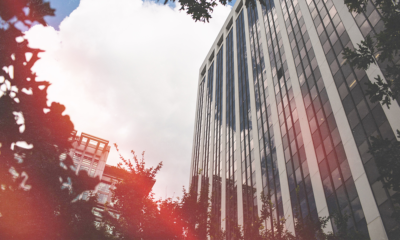 But when I started meeting with lawyers and charting out a business plan, I realized how involved the process of creating a nonprofit really was. I was just a junior in college at the time, and didn’t have any resources to get things off the ground or to file documents with the necessary agencies. Once I started putting my ideas into action, this really slowed my drive. It was super intimidating. I was lost and the people supporting me weren’t sure what to do either. But here’s the thing: you don’t have to work for a nonprofit in order to do social good. Both nonprofit and for-profit businesses have the ability to see a need and make an effort to do good with the resources available to them. A lot of people think that doing something for the greater good involves some grand gesture, but it doesn’t have to be. It can be as simple as creating content, advocating, or raising awareness. Any effort to put resources into a worthy cause is valuable. 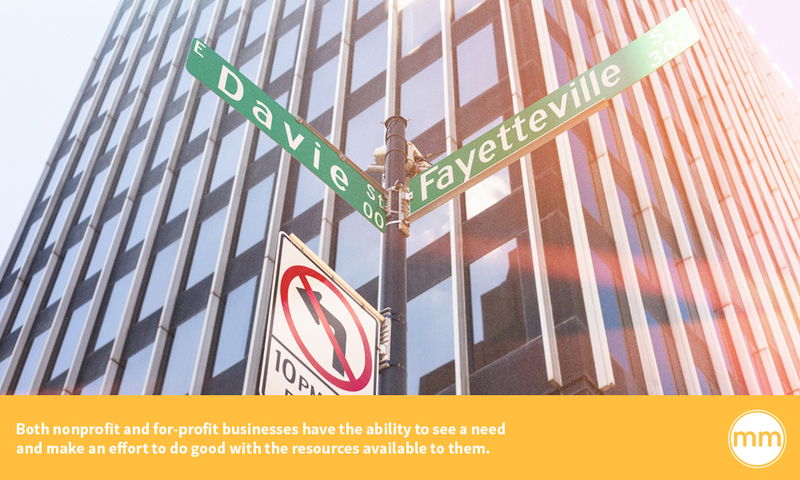 For-profit businesses often overlook opportunities to help with greater causes, especially small businesses. Whether it’s for lack of money or a lack of time, many for-profit workers are stumped when it comes to helping with a greater cause. But if you can rally your team or employees around a cause that they are passionate about, there’s a lot you can do for that cause without having to go through a long, involved process. First you have to figure out what issues break you or your team’s hearts. What are you angry about? What would you change if you could do some good in the world? 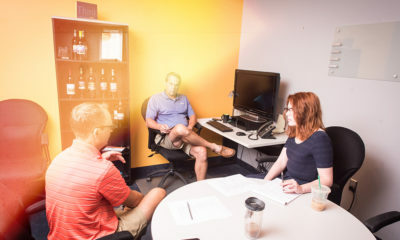 Once you understand what you or your team collectively are most passionate about, you can begin pursuing organizations that are trying to tackle those issues and consider partnering with those organizations. Building relationships with existing nonprofits is a powerful act as a for-profit company. And it all starts with the simple act of reaching out. You can send an email or a direct message on social media expressing your interest in getting involved. Ask how you can help. In many cases this can mean donating funds. Chad, our Creative Director at Palizay Media, is a great example of this. He has a business called Hope Delivered selling art and 20% of the proceeds go to organizations helping persecuted Christians around the world. Many small businesses may not be able to do this, and that’s okay. Money isn’t the only thing you can supply to help. You can also donate time. Nonprofit organizations often need assistance from volunteers. This could mean helping with a service project or offering your business’s services pro-bono to an organization. Donating resources, such as goods in-kind that an organization is in need of, is also helpful. 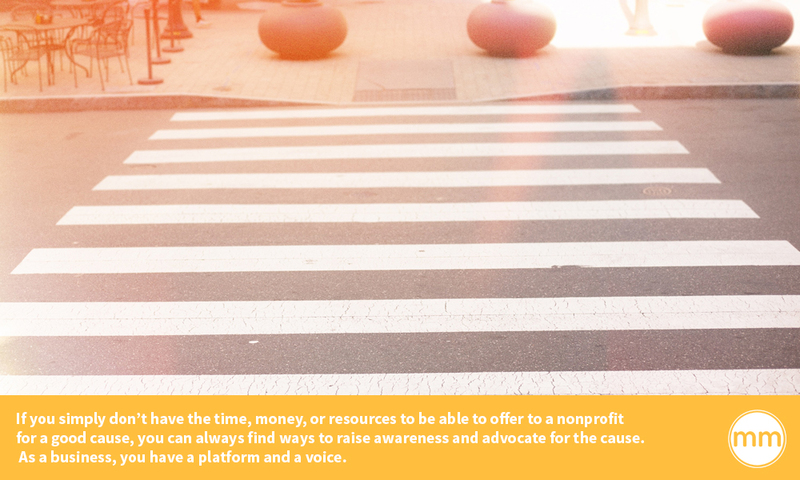 If you simply don’t have the time, money, or resources to be able to offer to a nonprofit for a good cause, you can always find ways to raise awareness and advocate for the cause. As a business, you have a platform and a voice. This may seem like a minimal act, but it’s powerful to be able to bring the message of a nonprofit in front of the audience of a for-profit company. Consider how you can use the attention you already have to deliver a given organization’s message to your audience, or redirect them to that organization’s platform. People have a tendency to see brands as faceless entities with self-serving agendas. Some brands are that corrupt, but behind every brand is humans— humans that likely want to help make the world a better place but don’t know how. For-profit brands that partner with nonprofits can dispel this image of malintent associated with brands. So partnering with nonprofits not only channels the power of for-profit businesses into something good, but it gives that for-profit business an image of goodwill. Let’s say you find yourself particularly passionate about an issue and are set on starting your own nonprofit. What should you do? First, do your research. I can tell you from experience that process of establishing a nonprofit is difficult. So you want to have all the information you can get. 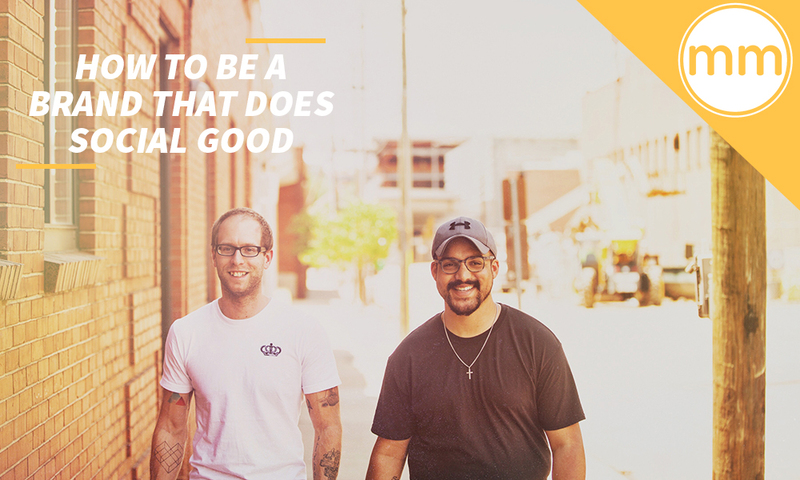 However, your work in social good doesn’t have to start as a nonprofit from day one. In fact, if you’re truly passionate and set on doing good, it shouldn’t start as a nonprofit. You need to start out with the social good— the actual doing good, “in the trenches.” By doing that, you’ll realize just how passionate you are about whatever it is you’re advocating for. A friend of mine, Jamie, founded the organization To Write Love On Her Arms, a nonprofit that raises awareness and education for people struggling with issues like depression, addiction, suicide, and self-injury. It started by him posting a story on MySpace (way back in the day) about his experience with a girl who went into treatment for addiction and depression. The next day he had received all these messages of support and people sharing similar stories. 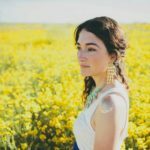 So Jamie started speaking out about these issues and advocating for them through blogging. He got coverage from news channels and began touring around the country around the world as his movement gained more attention. It wasn’t until Jamie quit his job as a sales rep for Hurley in Florida that he decided to pursue To Write Love On Her Arms as a full time job, as a registered nonprofit. 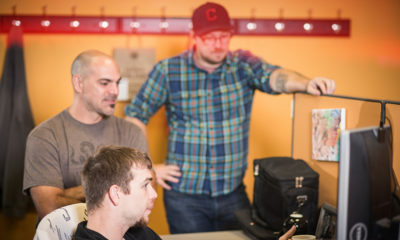 It started as a movement and gained steam before he decided to establish it as a nonprofit. By doing this, he realized how passionate he was about advocating for these causes, and was able to get enough support to sustain a nonprofit. Don’t rush it. Spend time doing good. Spend time connecting with people around your cause. If you’re just as passionate after 6 to 12 months of doing your good work, take it to the next level. It’s also important to find a mentor when starting a nonprofit. Between lawyers, paperwork, and gaining support, it’s a difficult process. Find people who can help guide you through the process because they themselves have already experienced what it takes to build a nonprofit. Be sure to get all the help you can get if you do decide to start a nonprofit. You will need it. No matter what path you choose in life, there’s always an opportunity to do good— to contribute to something greater than yourself. And you can do that social good whether or not your business is a nonprofit. You can build a brand and a platform, not just to get attention, but to direct that attention onto something good and important. If you’re truly passionate and are faithful to doing good, then the attention and notoriety will follow. People will see your passion and authenticity and will follow your lead. You alone may not be able to make a difference, but when people come together, it becomes a whole lot easier to make a difference.